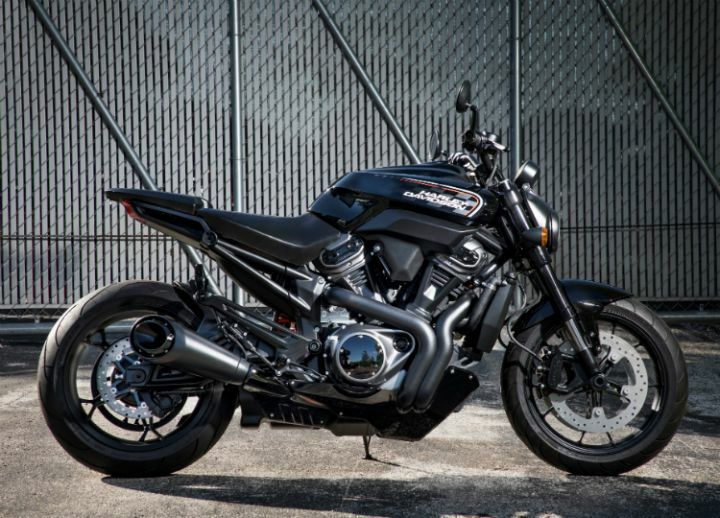 The all-new Streetfighter 975 is Harley-Davidson's answer to the street naked segment. It looks properly aggressive with a mass forward design and minimal tail section. The motor takes centrestage in the design, while most of the other design elements like round headlamp, turn indicators and instrument console are unmistakably Harley. The round headlamp gets a minimal, blacked-out cover. We expect it to feature all-LED lighting. The Streetfighter 975 features a single-pod instrument console. It may feature an analogue and digital readout or maybe even a completely digital layout on the production model. For a sporty stance and better leverage, the handlebars are flatter and wider. It gets bar-end mirrors like the Harley Street Rod, while the switchgear looks similar to the Street 750. The sporty fuel tank is all-new and slopes towards the rider. The bike also gets what looks like air intakes under the fuel tank. The seats are sporty and flat. The pillion seat is longer though, and should be more accommodating than the competition. There are no rear turn indicator stalks, which could mean that the tail lamp assembly could have integrated LED turn indicators. The taillamp is also expected to get LED lighting. Going by past Harleys, expect a bratty exhaust note from the minimal and sporty 2-into-1 slash-cut exhaust. While we do expect the rear monoshock damper to have some sort of adjustability, the front upside down forks appear to be non-adjustable. The footpegs are rear-set for a sporty riding position. Developed in-house, the all-new 975cc liquid-cooled V-twin motor is the third liquid-cooled Harley engine since the V-Rod and Street 750 series. We expect the new motor to offer Street 750 levels of refinement and loads of torque. Like most Harleys, the Streetfighter 975 will get a belt drive for a silent and lighter application. The Streetfighter 975 gets dual front discs clamped with Brembo radially mounted calipers and a rear disc with calipers from Harley Davidson. The new style alloys are wrapped in Michelin Pilot Street radials. Harley-Davidson is planning to launch the Streetfighter 975 by early 2020. We expect the bike to come to India by the end of 2020 via the CKD route. Expect the Streetfighter 975 to be priced between Rs 9 to 11 lakh. After riding the Harley-Davidson Fat Bob, we know that they can make fun bikes. Going by that then, the Streetfighter 975 is expected to be a hoot to ride. With the Streetfighter 975, Harley-Davidson also unveiled the Pan America adventure tourer (read all about this ADV here) and the 1250cc Flat Track Custom (Read all about it here).